“Angel of Harlem” is one of their songs, but I am not sure we can define U2 as “angels” 🙂 . And in fact they dedicated the song to the singer Billie Holiday. I did not remember this video, honestly. I thought it was different. Yet I love this song, and it reminds me of a nice weekend at the seaside with some cool friends. It was the beginning of January 1989 I think. Such things happen all of a sudden and you remember and love them for the whole of your life. U2 released “Angel of Harlem” on December 1, 1988. It aired continuously on MTV. After all, it followed the great success of “Desire” and the album “Rattle and Hum” was on top of the charts. Yet, some years later, U2 stopped playing it in concerts. They did not consider it one of their milestone songs. But fans did and do love it. and in many concerts they showed signs asking for this song. 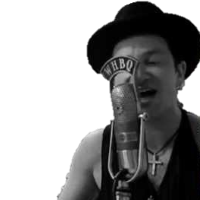 U2 used to invite fans on stage with them, but with this song sometimes even Bono did not remember the correct lyrics!!! ‹ Nice try, but try again!